Imagine you are in a beautiful location and you are looking as gorgeous as ever, the first thing you would want to do in such a situation will be to click at least a few selfies. You take out your iPhone to click some beautiful selfies and when you try to do that it reads 'cannot take photo' because your storage is almost full. It certainly is the most annoying yet common issue that many iPhone users face. If you are one amongst those then you certainly would want to know how to fix iPhone storage full problem. Well, all you have to do is continue reading and discover helpful tips. If you are one of those who use their iPhone camera almost every day then chances are bright that maximum storage space in your phone must have been consumed by the pictures that you take. With an improvement in camera technology, the quality of video and images also improves but the files keep on becoming higher and larger and your iPhone thus gets filled up really fast. So what should you do? Simple, just transfer your videos and photos to your computer or the Cloud. You can upload them to Google Drive, Dropbox, iCloud, etc. Or, you may even store the media files on your external drive and then delete them from your iPhone. There are sure to be at least a few apps that you installed but have used them maybe once or twice. It is now time you get rid of them. 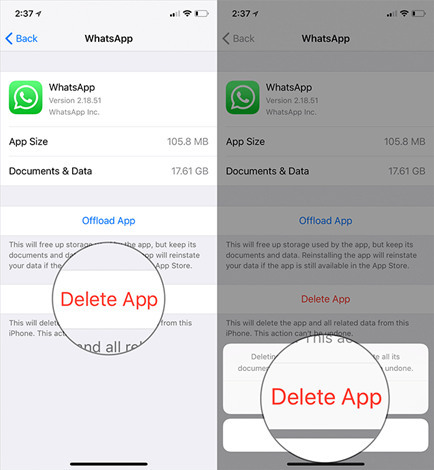 By deleting such apps you will be able to free at least a few gigabytes that too without much effort. Also, your home screen gets less crowded. Now, how do you find these heavy apps? Just go to the 'manage storage' section and you will be able to see the apps you use along with details of how much space they have consumed. If there is any third-party app you want to get rid of even that is very simple. Just tap and then hold onto the icon of that app on your Home Screen, and after the icon of that and the other app jiggles, you just need to press the X in the left side to delete the apps you do not need. This will also help you erase the associated data and documents. If your iPhone runs on iOS 8 or later then this tip will be useful for you. 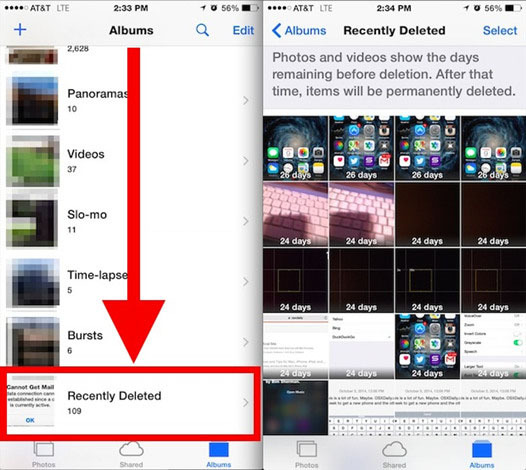 You likely do not know that in 2014 Apple introduced a feature known as "Recently Deleted". This basically serves as a trash can to help recycle your removed media items, so as to prevent any chance of accidental deletion. What you need to remember is that once you delete photos, to enjoy free space remember to remove them from the Recently Deleted section also. 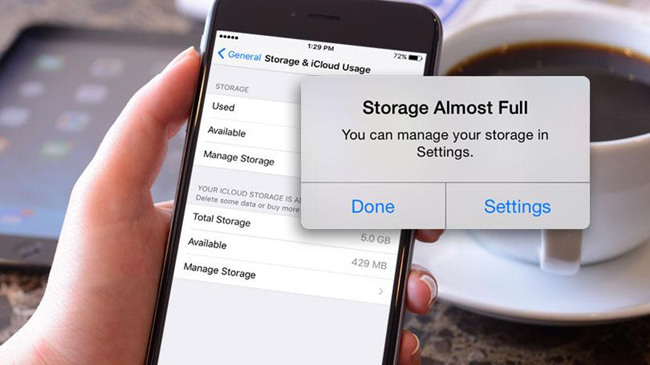 Messages stored on your iPhone takes up more space than you know. Your sent and received messages both stay stored in your phone unless you choose to delete them yourself. If you do not need these messages then by deleting them you can free up some space. Though this process of deleting messages may sound like a tedious task it can be done pretty fast. If you allow your iPhone to clean any messages that have been in your gadget for a set period, say a month or maybe a year, and then the whole process will take no more than a minute. 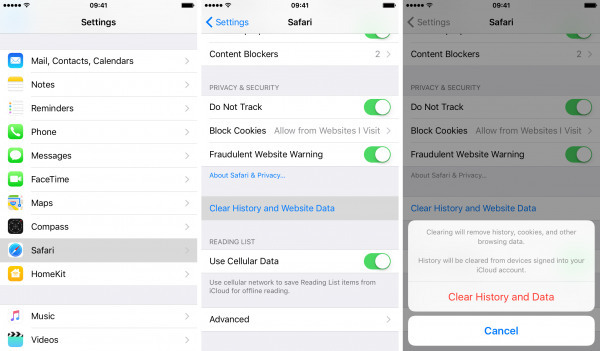 If you use Chrome or Safari to browse the internet on your iPhone then your device is storing web history, caches, and other data you perhaps do not require. Since they consume so much of space you should rather start cleaning them. The cleaning process is simple. If, for instance, you are using Safari then go to your phone's Setting section, scroll down and find Safari. Beneath the "privacy and security" section there is an option that allows you to clear website data and history and you just need to tap on it and confirm. If you have signed in on iCloud on your phone then this tip is for you. My Photo Stream is a helpful feature that uploads new pictures automatically and syncs them across your iCloud gadgets whenever you are connected to Wi-Fi. Though this a good option for photo access and backup, it does take up a whole lot of space. If you have a good back up plan then turning off photo streaming will fix the storage problem to an extent. If, accidentally you lose your pictures or any other data then too you do not have to worry as Joyoshare iPhone Data Recovery app is here to your rescue. This data recovery app can easily retrieve lost or deleted photos, contacts, videos, SMS, calendar, WhatsApp/Kik/Viber messages, and many other iOS data. It has 3 recovery modes because of which lost data can easily be recovered from iOS devices and iCloud and iTunes backup. This can be really helpful particularly for business people who get many voicemails every day. You may be of the notion that once you delete the voicemail it is gone for good. However, if you are using iPhone 8 or later then this is not what happens. Voicemails just get moved from a queue but are not deleted. If you want to delete them and free up some space then you first need to press the Phone icon followed by Voicemail. Now tap on Edit, select the voicemails you do not need and Delete them. You will notice there is a Deleted Message section at the bottom, do not forget to select it and then opt for "Clear All". You can free up a decent amount of untouchable storage space by cleaning the iTunes cache. iTunes does not manage any cache of the movies or songs you download and thus things keep on accumulating. However, you can clear the cache really easily. You just need to reach the Settings section, then the iTunes and App Store, press on your Apple ID and then select 'Sign Out'. Then you just need to go back and sign in. If you are a frequent user of your Apple Mail app then you need to know that it does take up a lot of space. Now, there are two ways you can free up some space – the first one is to manually go through and then delete the mail you do not require, which is time-consuming. The second and the better way will be to remove accounts and add them later if you need. This will help you get rid of offline copies of your emails and enjoy free space. This will not delete any data on your phone but will delete the cache. Facebook is one such app that does not clear its cache automatically. If you delete this app and restart your iPhone you automatically will enjoy some free space. These tips to fix iPhone storage full problem will certainly prove to be immensely beneficial. Do try them at least once and you surely will be happy with the good amount of storage space that you will then get to enjoy.